Associated Research has announced their free webinar schedule for 2018. 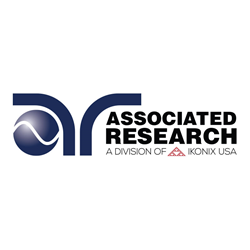 Associated Research, the leader in electrical safety compliance testing, has announced their webinar schedule for 2018. All webinars are free and designed to ensure that manufacturers and test operators have the proper knowledge and training to use high voltage equipment. Enhancements have been made to the webinars to contain more engaging content, including live demos and partnering with Associated Power Technologies to host a webinar in September. Contact the company at 1-800-858-8378, e-mail at feedback(at)arisafety(dot)com or visit their site at http://www.arisafety.com. For editorial questions, please contact Amanda Boothe at amanda.boothe(at)ikonixusa(dot)com. Founded in 1936, Associated Research is a worldwide leader in Electrical Safety Compliance Testing Instruments.